Butter a large baking sheet. Mix the apples with the raisins, almonds, lemon juice and zest, sugar and cinnamon. Melt 25g of the butter, fry the breadcrumbs till crisp, and reserve. Clarify the remaining butter: melt it, reserve the oily top layer, and discard the milky residue. Unwrap the filo. Lay out a clean teacloth, dust lightly with flour and cover with a layer of filo in a rectangle about 40cm x 60cm. Brush with clarified butter; cover with another layer of filo and sprinkle with the breadcrumbs. Spread the filling down one of the long edges, leaving a margin at each end. Tuck the two short ends over the filling. 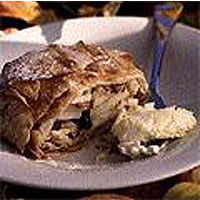 Pick up the two corners of the cloth nearest to the filling and roll the strudel away from you, allowing it to curl over itself. Pick up the strudel in its cloth sling and tip it onto the baking sheet. Brush with a little more butter and sprinkle with a few drops of water. Bake for about 40 minutes, till the pastry is crisp and brown and the filling tender - test with a skewer. Dust with icing sugar and serve warm with whipped cream.